According to the Google, a mash tun is a vessel used in the mashing process to convert the starches in crushed grains into sugars for fermentation. It’s also a popular spot on Wharf St. in Portland. After a walk down brick and cobblestone paths, we made it to the not-very-old bar/restaurant in the hopes of grabbing some food and drink. I hadn’t done much research about the place, but I did see some pictures which gave me the impression it might be one I’d enjoy. Indoor and out door signs told potential patrons walking by that the locale had a significant selection of beer and cocktails available. That seemed like enough of a reason to go in, but just in case it wasn’t, the outdoor A-frame also commanded passersby to “Get In Here”. I did just that and was pleasantly surprised with what I saw. The lengthy room sported a bar from beginning to end and two or three three large tables. It was busy and the lively crowd seemed to gel well with the cozy atmosphere. We hardly had time to sit at two seats at the far end of the bar before we were given menus and asked what we wanted to drink. We weren’t quite ready yet, but our confirmation that we were going to eat prompted the Drew Carey lookalike bartender with a name tag of “The Price is Right – Drew Carey” to provide us with the evening’s two specials. He also pointed to the entrance and said to help ourselves to the spring water and orange Pellegrino over there. There was a chalkboard at the far end of the room where we were sitting which listed an inordinate number of beers – most on tap and a few in bottles. Most of them were local with a small handful from outside of Maine and even less from outside the country. 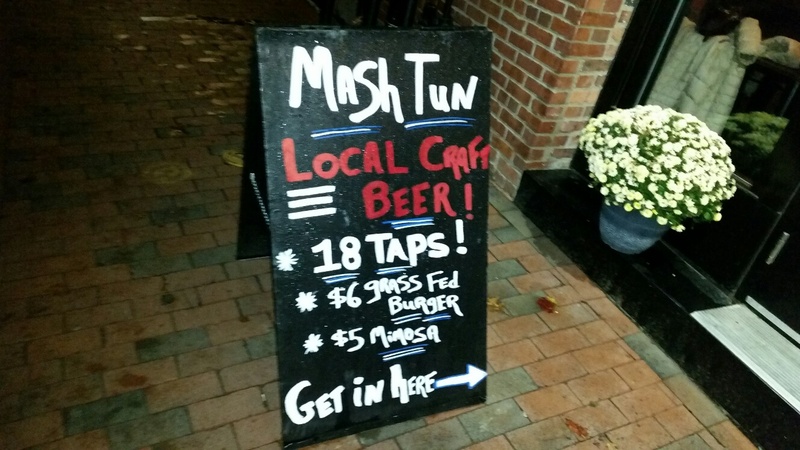 With about 30 to choose from, I was looking for something from a Maine brewery I hadn’t yet tried. There were plenty of beers I hadn’t had, but unfortunately there were no breweries that were new to me. That was okay, but it turned my attention to the cocktail list where I found The Uncle Pete – vodka, prosecco, oj. In honor of my nieces, I decided to get that. My wife ordered a Dark and Stormy which happened to be a perfect description of the weather that night. It didn’t seem like many patrons were eating, but I certainly still was and began looking at the food choices. It was a simple menu with 10 items which seemed like it would make for an easy decision, but I dilly-dallied, taking my time to decide as my wife started aggressively telling me what I should have. Finally, with a little help from Mrs. Portlandeater, I made my decision. 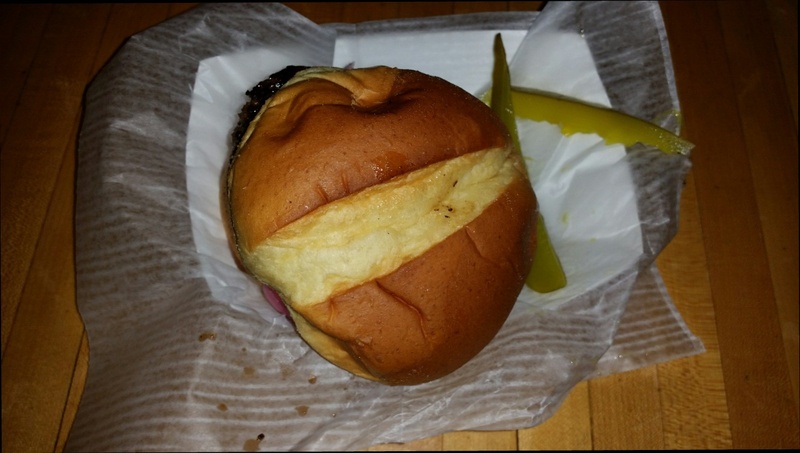 I ordered the Grass Fed Burger which the menu indicated was cooked to medium. 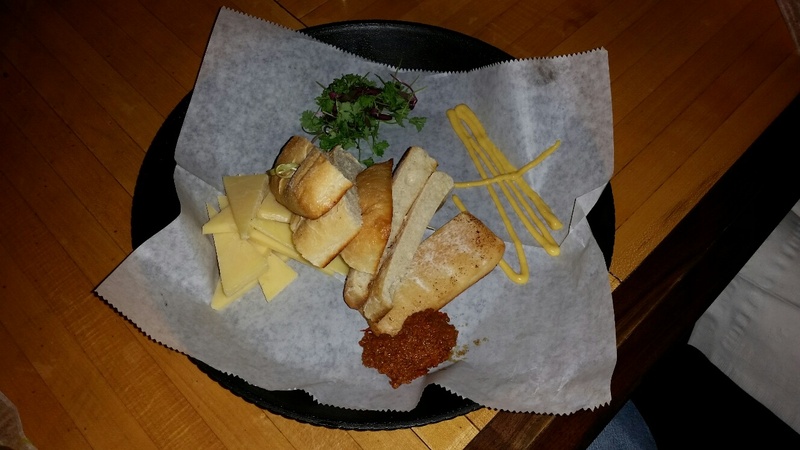 I also requested the Cheese Plate – Dubliner Cheddar Cheese, honey dijon, chef’s seasonal jam, and warm French bread. 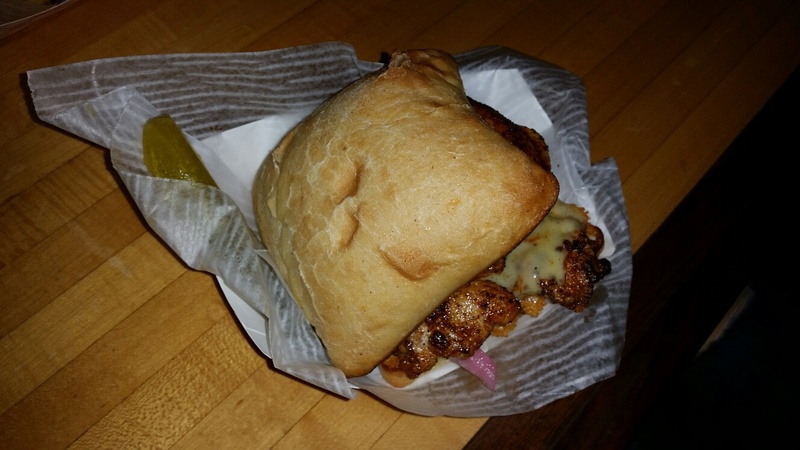 She went with the Mesquite Chicken Sandwich – mesquite rub chicken breast on a ciabatta roll with Dubliner cheese and pickled onions – and an order of Parmesan Ranch Fries. 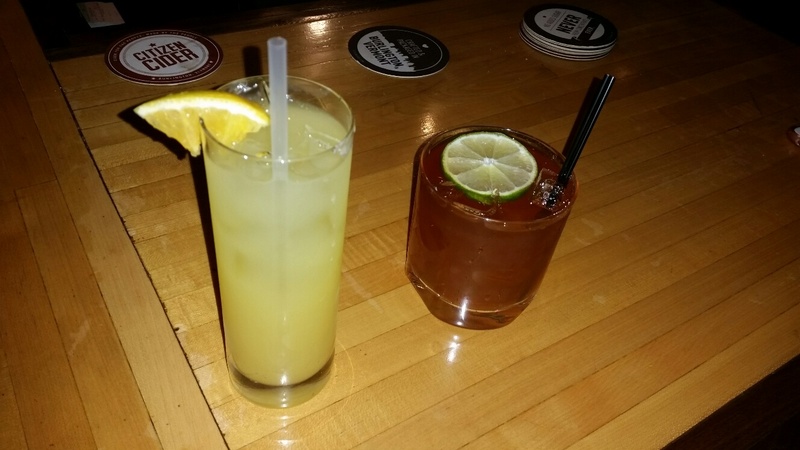 A different bartender than the one who took our orders brought us our libations. As has happened before when I requested drinks which seem a little on the feminine side, the bartender served mine to my wife and hers to me. A quick switcheroo led me to a sip of the mimosa with vodka which, expectedly, tasted like the breakfast cocktail. We both drank a bit and watched as our food was made in the mini kitchen behind the bar by a cook who seemed to be – figuratively – on fire. With a grass fed burger here and a mesquite chicken sandwich there, he went to town with feisty, back-bar cookery. Our food came out once it was all ready. My burger came with pickled onions, tomato, and a couple long, thin slices of pickle on the side which I just threw on top. The cheese plate had bacon bourbon jam, a pile of fresh parsley, and grilled, sliced ciabatta instead of freedom bread in addition to the cheese and mustard. My wife’s chicken was as described and her fries were topped with an insane amount of parmesan which was perfect for the cheese lover in me. I was considering putting some ketchup on the burger, but figured I’d try it without first. It was delicious with high-quality, simply seasoned beef and a nice veggie combination. I was shocked at how good it was without condiments. A couple bites of that led me over to the cheese plate. I took the bread and tried the jam with it. It was mild, but tasty. The addition of the cheese made it even better, and a smattering of the honey dijon made for an excellent open-faced cheese sandwich. As I worked my way into the food, I realized that I had more cheese than I needed for my bread. I took a couple pieces and shoved them into my burger. It made for a fine variation of the yummy sandwich. I also made time to work on the fries which went down easily and cheesily, though they seemed to be without any ranch seasoning. I ate some of those with ketchup and also forked some to get extra grated parm with them. All together, the food turned out to be a sizable meal. My wife finished with her sandwich and I finished the last remaining bites. It was a typical mesquite chicken and the cheese and onions worked it over nicely. 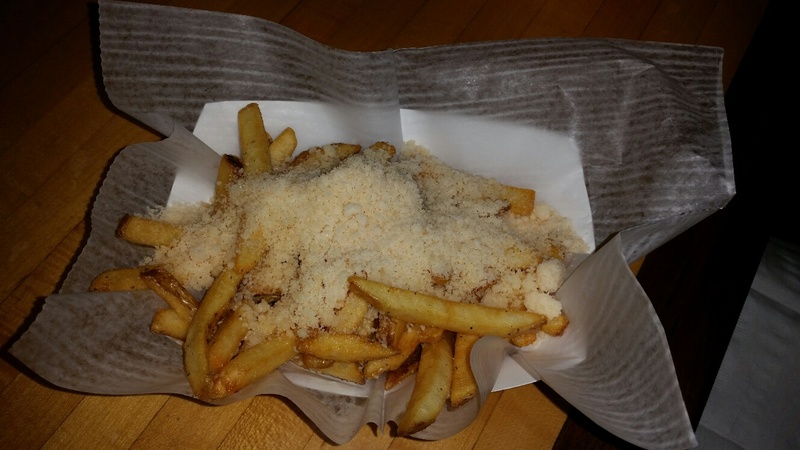 My wife ordered a glass of Prosecco as I scooped up the last bites of grated parm from the fries and finished my drink. It had been a good meal, but what really stood out was how well everything there worked so well together – the neighborhood atmosphere and supremely awesome beer list, the grand bar and excellent service, the simple, but solid food. And their location doesn’t hurt. 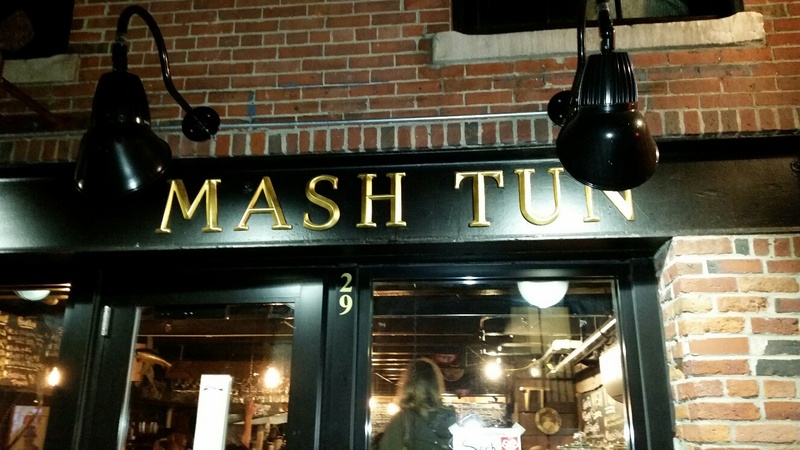 It seems like great place to warm up in the winter and a perfect place to have a beer pretty much any time. With no food over $10 and most drinks under that too, they won’t ask for all your cash. Our meal came to $48 before tax and tip and it was well worth it. I think Portland has another place that will be around for a while. I’m certain plenty of locals have already been there, but they’re sure to be a favorite of locals and tourists alike for a long time to come. This entry was posted in Portland, ME food on November 6, 2016 by peterpeterportlandeater.